Ken Austin thanked members for honoring him at the reception. Introducing Diana Eagles– our new, hospitality chair! 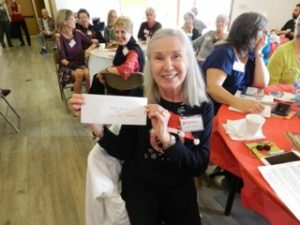 Diane Darnall – membership chair made an announcement on renewing your CFWS membership. All CFWS members are invited to our next board meeting on April 18 at 10 am at the Casselberry library on Oxford Rd. Snacks provided. Interested in becoming our new PRESIDENT AND VICE PRESIDENT? 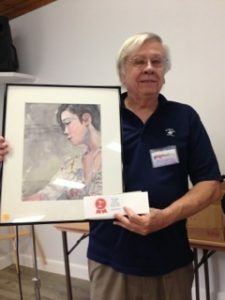 Membership in CFWS has many benefits: free demos, developing your skills in workshops, displaying your artwork in various exhibits, networking with other artists and organizations, accessing our CFWS library of books and DVDs’, outreach to our community and introducing the public to the wonderful world of watercolor. 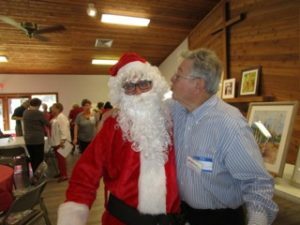 Volunteering has been documented to keep you physically and mentally active by allowing you to use your talents and experience. Managing our operations with volunteers is critical to keeping our fees low. Contact Teresa Chin or Mary Dall asap to learn more. 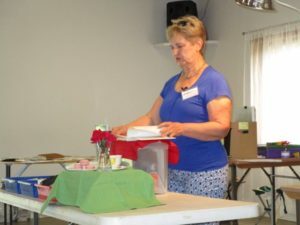 CONNIE HAMILTON gave a wonderful demo on the healing power of journaling. 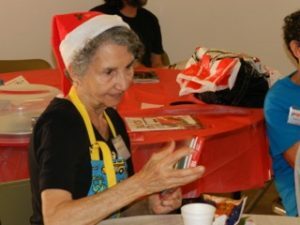 She provided handouts and many samples – 37 books – of her work. Impressive! Some popular journalists include Roz Stendahl, Liz Steel, Thomas Thorspecken, and Gabriel Campanario, who began the urban sketch movement. 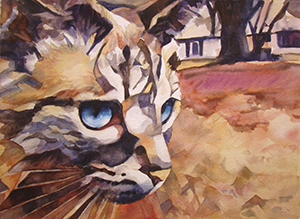 Strathmore watercolor is one of her favorites. Bienfang, 97lbs. is too light. You can draw anywhere: jury duty, hospitals, the beach or what you had for lunch. 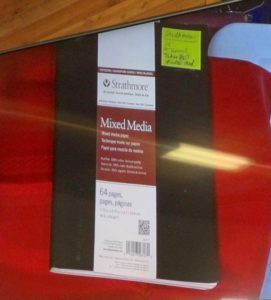 Strathmore mixed media without rings is a good journal. The Beta series premium sketchbooks have good heavy paper. Her favorite pen is a Micron, but many journalists use fountain pens. 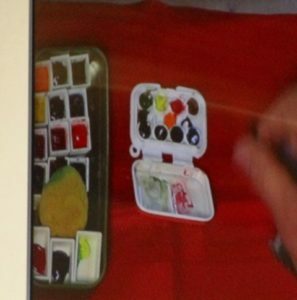 Koi paints in small pocket sets work well for travel as well as getting a small empty palette and fill with your favorite paint like Daniel Smith or Winsor Newton. 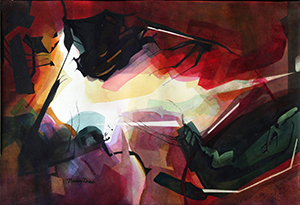 Escoda or Jack Richeson brush kits are good travel brushes as well as piston watercolor brushes. 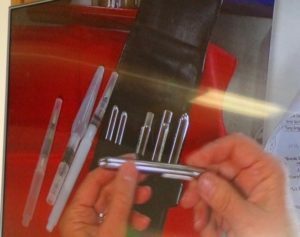 The Art Toolkit has several small sizes for purchase. 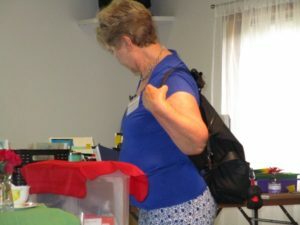 All of her supplies fit into a handy backpack and away she goes! Her final tips: 1. 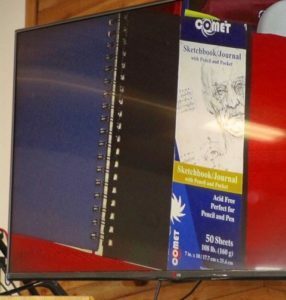 Put a sketchbook in your purse/pocket. 2. Draw what moves you. 3. Enjoy other people’s work. 4. Draw in a group. 5. Follow your passion. Check out: Connie’s Color on Facebook and conniehamilton563 on Instagram to see her work! Thank you Connie! 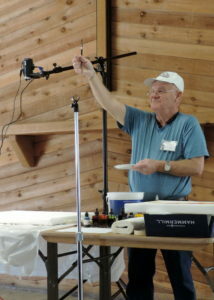 Thanks to Michael Holter we all learned about a “Swashbuckler Wash” at our March 3rd demo. He painted a boat silhouetted against a sunrise wash. Using a large brush he mixed up a stew of colors, showing us how to shift the colors to the warm or cool spectrum. 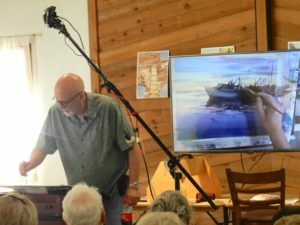 He finished the painting by scrapping out with a credit card to demonstrate all sorts of tools can be use to create a great painting. Marcela has been busy once again lining up many plein air activities for us. 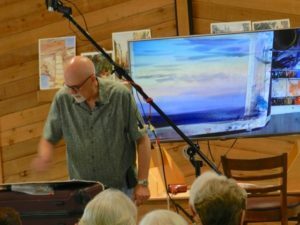 Michael Holter mentioned that it was a great practice to paint on location to increase speed, observation and considers it vital in the artistic process. April 20 – Environmental Garden in Oviedo. All CFWS members are invited to our next board meeting on 3/21 at 10 amat the Casselberry library on Oxford Rd. where we’ll discuss the upcoming season. WE NEED A PRESIDENT AND VICE PRESIDENT to satisfy the requirements of our By-laws and 501 c 3. Otherwise, our society is in danger of having to disband. So far, The board, Mary and I have had no luck in finding someone to step up to either of these positions. If we want this society to continue, we need to find 2 folks who would like to work together. Our next season is set up and information is organized in easy to access files so no one has to “reinvent the wheel”. Contact Teresa Chin or Mary Dall if you would like to learn more. 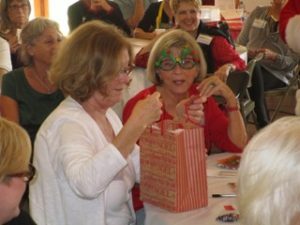 December 2, The CFWS Holiday Party was a big success! It was our first party in our new location. We had 57 members and 2 guests. 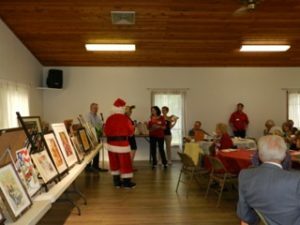 A bit smaller this year, with the board providing finger food, snacks and drinks, while members added sweet treats, but cozy and fun and we all had a great time! 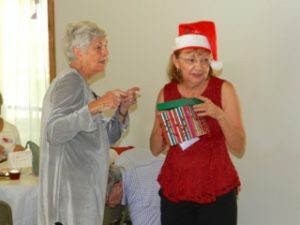 Santa, Vera, Deborah and Krys helped pass out the wonderful door prizes, of which there were many. There were so many beautiful paintings to choose from! 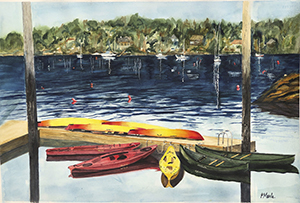 Congratulations to the People’s Choice Award Winners: Susan Grogan (1st), Bob Hague (2nd) and Marian Wagster (3rd). Our CFWS non juried show reception for Mt. 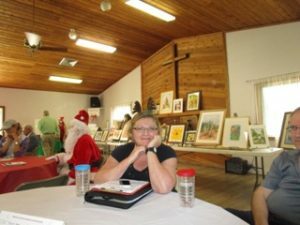 Dora Center for the Arts is Dec. 14th from 6 – 8 pm. Please bring munchies. 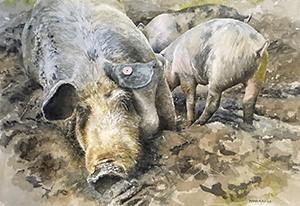 20THANNIVERSARY Annual Juried Members Show – JPEG images due midnight Jan. 6,2019 – $25 for one entry, $30 for two. 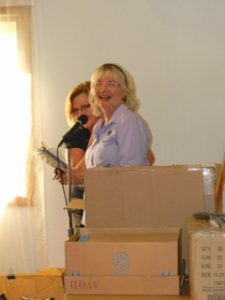 Kim Minichiello discussed the Florida Watercolor Convention in Orlando next year and introduced Susan Donohoe, volunteer coordinator. 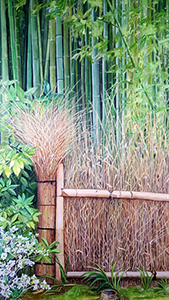 Our own CFWS member show will be March 4 – 30that the Casselberry Art House. Deadline for submissions is January 6, but don’t wait until the last minute! 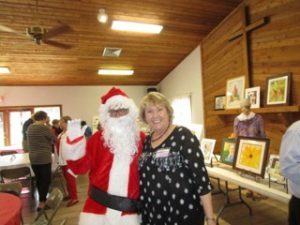 Remember you can make a year end donation through the United Arts website. 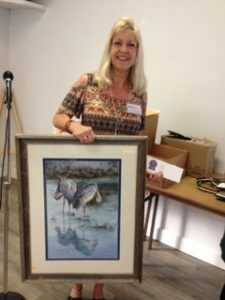 Type in the Central Florida Watercolor Society in the large box marked “other Organization Name”. Donations will be matched by 15%! Pass the word. Please remember we start our meeting at 1:45 now. Doors will be opened at 1 – 1:15 only for those setting up the meeting space. 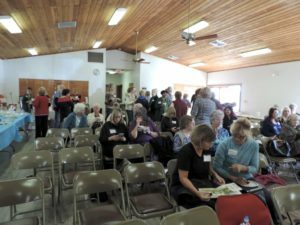 We welcomed 56 members and 6 guests to our Feb. meeting. 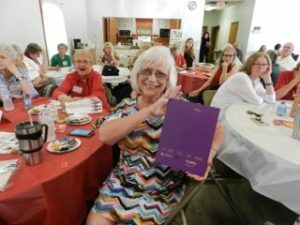 Members were reminded of our “Sell and Trade Book” – for who have extra art supplies. “How to” instructions on the cover of the book. Tickets sold well for the 50/50 and chance to win! February 24, 2PM – We had a docent-led tour for members of the CFWS for: Towards Impressionism – Landscape Painting from Corot to Monet, the new exhibit at the Cornell Fine Arts Museum on the Rollins College Campus in Winter Park, Florida. 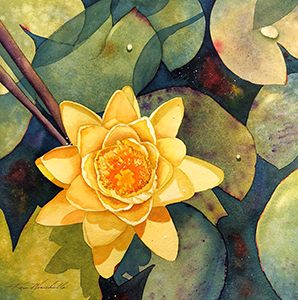 We congratulated the artists who were juried into the 2018 Leu gardens Members Show! 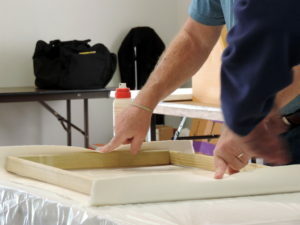 We know everyone worked hard at their art and they would like to show their work to a large audience. 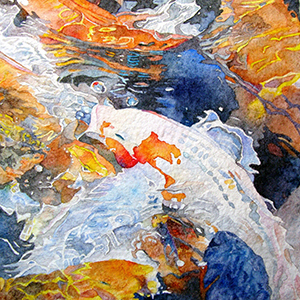 Therefore, the CFWS Board has decided that later in the year we will be looking at having a non-juried online exhibit, on our website, so that all members have an opportunity to show their work to a greater audience. 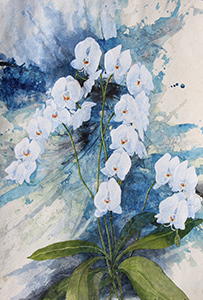 March 12,13,14 – 9:00 am – 4:00 pm Suzanna Winton workshop at McRae Art Studios. March 25, 2018 1-4 pm. 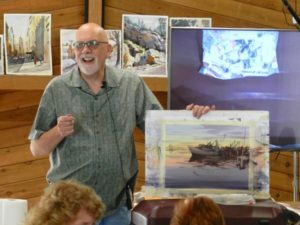 Polasek Pop Up One Day Event of CFWS watercolor plein air demonstrations, and outreach to the public. Check our website for more information and register to paint in the gardens. 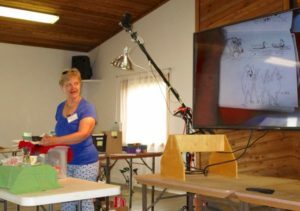 After our announcements we were treated to a fascination and fun demonstration by Faye Tambrino. She started with a pour of colors and let the paint do what it wanted. Then she used a variety of tools to add textures to spark creativity. 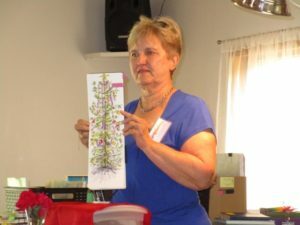 Faye is a wonderful teacher who uses humor and tips in her instruction. 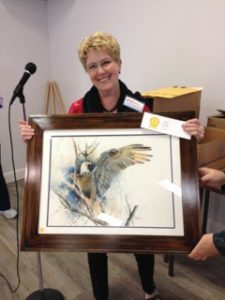 She teaches watercolor at the Mayflower Retirement Community. Happy New Year to you All! Hope your holiday festivities were good ones. We welcomed members and special guests to our new location in the Altamonte Chapel Social Hall. Our new storage area is set up and we are happy to have such a nice space. Our new library cart holds lots of books. Thank you Mary for sewing the new cover! The first meeting in our new location was well attended and we had a fascinating lesson in stretching 300 lb. 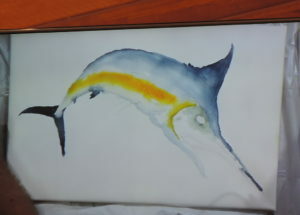 paper, and painting a beautiful Marlin by Glen Ward. This was a great way to kick off the new year. Please remember we start our meeting at 1:45 now. Doors will be opened at 1:15 only for those setting up the meeting space. Thank you to all of our members for turning in surveys, to Annette, for the United Arts grant application. We appreciate your input and will tailor future events with this information in mind. 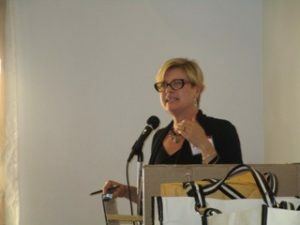 Faye reminded us that we have 4 spots left in our Suzanna Winton workshop, so please get your seat reserved soon! A fun opportunity is coming up April 14th. We need a couple of volunteers to help plan out the details for a community Craft Day at the Altamonte Chapel campus. Please email me. 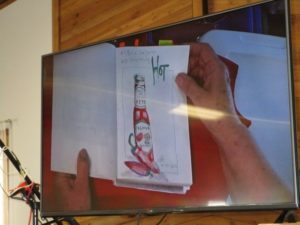 Cindy and John announced a special March 25, 2018 “Pop Up Event” and painting exhibition at the Albin Polasek Museum. We passed around 2 sign up sheets for refreshment volunteers and greeters and got a very strong response. The committee is working out the details of this very special opportunity to promote our society in a lovely garden location. We have a lot more in store, so keep checking our website and newsletter for more information and opportunities.